Does Glitch overwrite X-Forwarded-Host header? Hey! I set up a custom domain using Fly. 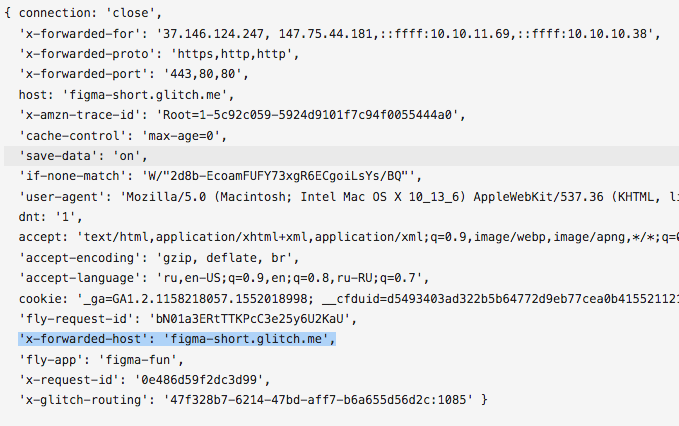 I’m accessing it from the figma.fun domain, but the X-Forwarded-Host header seems to be always set to figma-short.glitch.me. I’d like to do different things based on the TLD, but currently it doesn’t seem to be possible. And I’m trying to understand if it’s the problem with Fly or with Glitch. I thought that maybe Glitch forwarding mechanism is resetting the header but it doesn’t. If I set the backend to 47f328b7-6214-47bd-aff7-b6a655d56d2c.glitch.me on Fly, the behavior stays the same. @zyumbik: Yep, but how do I set XFH to a different host in the App?